It’s time for everyone to go back to school, even the 5th graders from my dissertation study at Lanley Elementary. Except this time I won’t be with them. I am staying home today (and 3 days a week this entire semester) to write about them. I have a little under 4 months to write their story; I officially applied for graduation last week. The largest part of their story was the last few days before winter break. These days were some of the most rewarding of my entire career, showing me that the type of social justice oriented, authentic curriculum can be beneficial for the teachers as well as the students. First of all, the students spent time at the beginning of our final week together deciding to donate their money to the Barnabas House. We had a great discussion about where to donate where they had to analyze the information from our guest speakers, make a decision (backed with evidence) about why their profits should go to a certain place. (Hello Common Core Standards!!) In the end, the students decided on the Barnabas House. The Barnabas House is raising money to build a huge facility for homeless youth in Holland. I think this organization appealed to the 5th graders because of Michelle, their director. She was great with the kids, telling them personal stories of children she knew that didn’t have homes. Without me prompting her, she just naturally talked to them like colleagues. Like she would anyone else who had taken an interest in helping children. She also gave them choice. When they asked her what their money would help do, she told them that they could personalize their donation and have their money go toward anything that they thought a house would need. This lead to another discussion about what they could do with the money. In the end, I think the students one of the things they wanted to donate was a fish tank, so the homeless youth could have pets to take care of and be able to watch the calming water. How amazing is that? The very last day before break the school had a Christmas program. We decided that right before the program, the students would present the donation to the Barnabas House and tell the parents what they’ve been up to. The few days before, a few students took on the job of writing a script to read and then the afternoon before break the students practiced what they would say. We also tie-dyed T-shirts (blue of course) as our “uniform” for raising awareness of child abuse. They wanted to make a “big check”, so we did that as well. The last day before break was pretty much entirely planned by the students and guided by us, and they loved it. The other 5th grade had a pizza party and cupcakes and none of our students complained that we didn’t have a “party.” We were too busy having fun learning. In the end, the students made about $650 profit, which is an insane amount of money from selling the little things they did. This was after they paid back their loans to me. The “Whitlock Store” had collected about $150 in costs from them buying supplies, so I agreed to donate that as well (after all, that was Whitlock Store profit–I can be a social business too!). All in all, we had $800 to give to the Barnabas House. When the students all got up in front of the parents to tell them what they did, and when Tommy read the total amount, the entire audience cheered and clapped. Neither the students or I expected this reaction–the looks on their faces were priceless. The Barnabas House is buying a fish tank (among other things) with the money, and all the students’ names are going on a plaque by the tank (Michelle is going to make sure of this). But, more importantly, the students now have “real proof” that they are helping a need in the community. After interviewing them for the post-data, I could tell they now have a broader understanding of human rights and human rights issues both here and around the world. If they haven’t completely transformed into human rights activists by the end of the semester, I can say at least One Hen opened the door for the conversation. And, we opened the door for them at age 10, instead of like 18 or 20 when most of us go to college or travel and realize there is a world bigger than us. The students are also planning to help with the Barnabas Winter Silent Auction and even with construction in the spring. They have found their “cause” and passion. For the 2011-2012 school year, the ISD in our county has 888 students registered as homeless. Of that number, 127 are listed as unaccompanied. A student self-report survey in 2011 showed that 113 8th, 10th and 12th graders had no place to sleep at least once this school year in our community. These are obviously not national statistics, they are right where I live. And a group of 5th graders did something this year to alleviate this problem. Just that is pretty amazing. This has been quite the week at the school (I’ll need pseudonyms soon I think…). In my last post I wrote that since the students had chosen child abuse as their issue to solve with their social businesses, I was a bit nervous that we wouldn’t find a product that would help solve that issue. Child welfare is not really something that can be solved with products or services. I had come up with a back-up plan of making child-related things like toys or books and I was going to pose this to the students as a “close enough” option. Turns out, the kids had other plans. Since a few of them had researched that blue is the color of child abuse awareness, they were all really set on making things that are blue to educate others. The classroom teacher had shown them some statistics about abuse that shocked and angered them and they wanted to get the word out. After talking about it, the kids thought that as long as they made blue items that kids wanted to buy, they were reaching their target audience. The classroom teacher liked this idea too and used the opportunity to talk to the students about how they treat each other in the classroom. They are so concerned about abuse of other children, that they are allowing abuse of children and adults in the school happen every day— bullying. Right around this same time, the class had gotten in a lot of trouble for being horrendous to their substitute teacher one afternoon. After that debacle, sadly, this class has formed a reputation in the school as “the bad class.” It is a small handful of students causing trouble, and certainly not the whole class (as is often the case), but yet the mistreatment of other students and adults in the building is consistent. It seems that despite their care and concern for child welfare, some parts of this re not transferring to their personal lives. As a researcher, I find it interesting that the subject of social studies is where this kind of teaching falls to–learning how to get a long, how to treat others, how to work as a team, etc. I am just now starting to see the students learning social studies content, and we are 4 weeks into a social studies unit. The main concept the students are starting to grasp is the idea of the relationship between revenue, cost, and profit. When choosing their “blue item” to sell, I told them to find products where they can spend very little money so their costs are low and their profit can be high. They really responded well to this challenge. Many of them chose products that need very little materials to make. 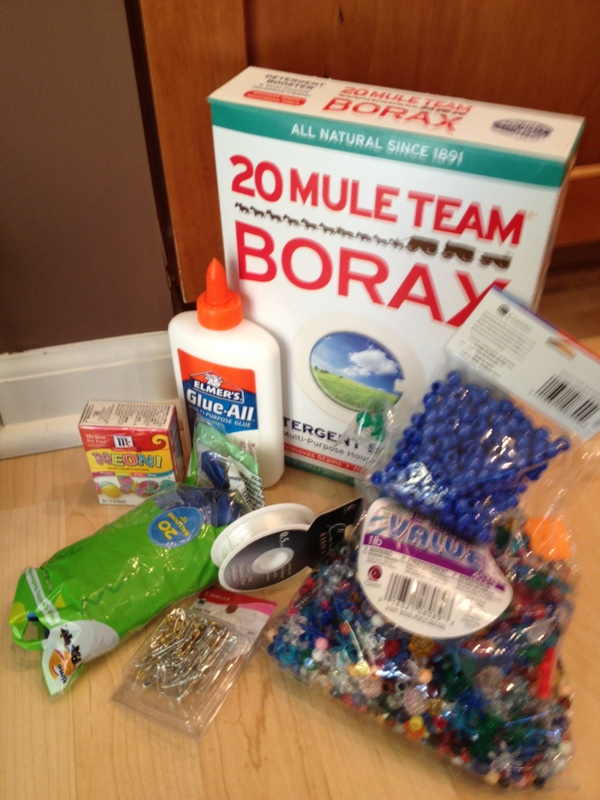 Two teams are making jewelry of some kind, one team is making stress balls out of balloons and cotton, one team is making calendars of their own artwork, and one team is making slime to sell (blue, of course). 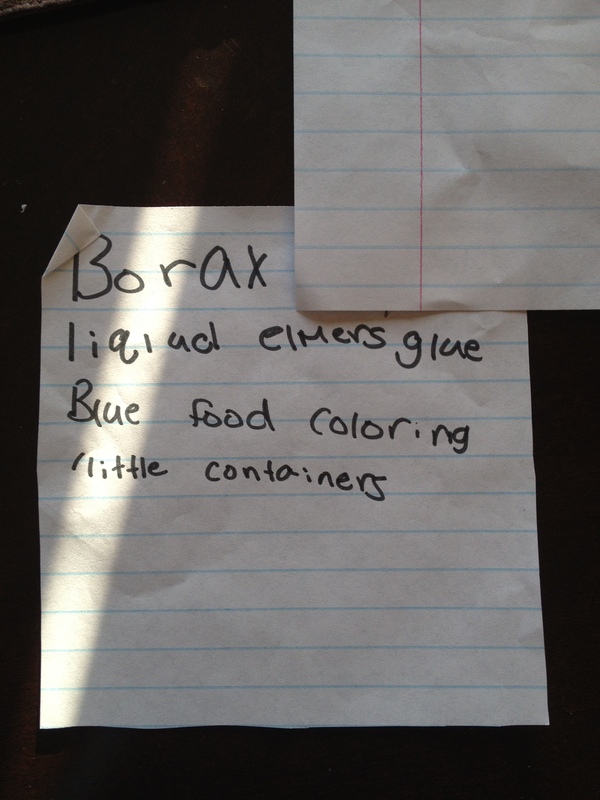 They took great care in listing their “costs”, and then I purchased everything the kids would need to make their products. They are going to “buy” their products from the “Whitlock Store” on Monday. So they are learning! I see a bit of a different class than the rest of the school does. I see kids that are excited to learn but having trouble carrying over the lessons into real life yet. I am hoping the troublemakers find a new set of skills they can feel successful with in this project and turn their negativity in positive social change. 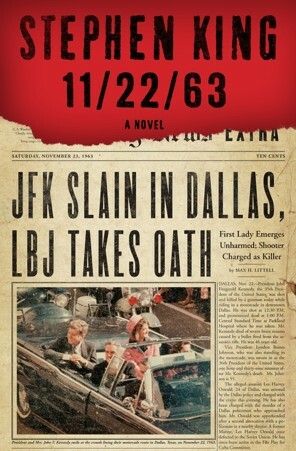 Near the end of the summer, I started reading the newest Stephen King novel called 11/22/63. It’s about time travel and the date refers to the Kennedy assassination and how someone goes back in time to stop it. Being that I love the Kennedys and time travel stories, I got very into this novel right away. However, it’s an 800-page novel that I began right before my semester, so of course I only got abut 100 pages into it before I had to take a pause. In the first 100 pages, King writes about “watershed moments”–important events that may seem small but change the course of direction of time. Watershed moments are important in time travel because it’s the moments that could make history go one way or another (like JFK dying), but they are also important in a similar way (but less intense way) in dissertation data collection. I have been waiting to try to find a “watershed moment” in this One Hen unit I’ve been teaching and watching unfold in the 5th grade classroom over the course of the last 3 weeks. Watershed moments are good to write about because of their impact and how they can possibly change the direction of a study. My committee even suggested that I narrow down my data focus ONLY on important, watershed moments in the unit so as I only spend time writing about these things instead of every small detail. Finally, this week I believe I have witnessed the first watershed moment. It came when it was time to tell the students they would actually be running a social business. I explained that a social business has the ultimate goal of helping people and that we would have to think of two ideas– what to make and sell and what issue or problem we would like to try to solve. There was a lot of excitement about starting a business: “We’re going to make something we can sell? A REAL thing? Not just pretend?” “We’re going to make real money? Do we get to keep it?” They got even more excited when I had them fill out job applications to be a manager, a marketer, and on the production team within their business. They really took this seriously, working very hard on their applications which we told them had to represent them in the best way. Every day this week I have gone into school they ask me if we’re doing One Hen that day. I am thrilled to see them so engaged and excited; I have seen this with every school that I piloted this unit in at NHA. It’s something for another study another day, but it’s saying something when students are actually excited to learn. Good things can happen. The watershed moment was when I got to see how the students embraced the “social” part of the social business. I started by having students brainstorm a list of issues and problems in the community that they would like to help “solve.” Prior to this I had them research in the computer lab and browse some websites. It was great to see their eyes light up and the wheels turning as they were learning new things about the world around them. The students came up with a huge list of world issues, ranging from the very broad, global issues like hunger, poverty, homelessness to things that they had more personal connections to: bullying, abuse, cancer, violence. We voted to narrow down our list and decide on a cause that mattered to us the most. As we were narrowing the list, I asked students to raise their hand if they had a personal connection to a cause. For example, when we talked about cancer I asked if anyone knows anyone with cancer or knows someone who died of cancer. Every person in the class raised their hand, which surprised them. I was more surprised when I asked if anyone knows/knew anyone who had been abused and nearly everyone raised their hand. In the end, the students voted that child abuse was the issue they wanted to tackle. The fact that so many of them have a personal connection to this is so sad, but the fact that they all were excited to do something about it gave me hope. But this posed an interesting dilemma, since finding a product or service that helps stop child abuse is virtually impossible since we aren’t trained counselors and doctors. So we decided to broaden their thinking a little by leading them to expand their idea of creating a business to promote child welfare. We then brainstormed ideas of products and services we could produce that would improve children’s lives. They came up with great ideas–books, comfort toys, food. They also, without prompting, wanted to raise awareness of child abuse. Some students had researched the “color” of child abuse–blue– and wanted to make blue products to advertise to others some of the horrible statistics about child abuse that they found. Everyday these students have amazed me with their caring, thoughtfulness, and creativity. It’s amazing what kind of thinking students can do when given free range to think. I have left every day with so much to write about that I’ve gotten into the habit of talking into the iTalk app on my phone for the 15 minute drive home. This is why I love teaching because it’s my ultimate inspiration. Without students, I have nothing to write about. I look forward to seeing what else is going to happen. It’s been a couple of weeks since I chatted up my whiteboard, and I have since added to it. I have been thinking about how to analyze the data in my study, and I think I have a plan. Give the students a written pre/post test to discover what they learn about economics in the One Hen unit, using the National Economics Standards to guide me. And also interview the students about their interest in helping the community and participating in a project that helps others before and after the unit. I have an idea of what some of the questions could look like–both for the written econ assessment and the interview. I think all of the other data I collect would be secondary and perhaps only used to support my claims–things like student work completed during the unit, or transcriptions of class discussions. This pares down my data to pre/post assessment and pre/post interviews, which is much more manageable. My new problem is this: where does this experience at this school doing this unit fit into a larger picture? If the school where I am collecting all of this data and the One Hen unit the students will experience is such a special case, special enough to study, what is it a case OF? I put off thinking about this for a while and I focused on a few other things– making tweaks and improvements to the One Hen unit, for one. Drafting questions for these assessments, working on my IRB application, etc. Then I went through an old e-mail from right after my dissertation proposal defense from Kyle, a committee member of mine, about Mohammed Yunus, the “creator” of the concept of microfinance. The One Hen unit teaches the students about microfinance and Kyle thought I needed to read up on Yunus a bit. I read his wikipedia page and promptly ordered his most recent book Building Social Business. In a nutshell, Yunus started by giving small loans to poor people in Bangladesh, inspired by women unable to get loans from banks to start their own small businesses. Eventually he started his own bank specializing in giving collateral-free loans to those in poverty, especially women. This concept of “microfinance” is the heart of the One Hen unit, and I can see why Kyle wanted me to read up on Yunus. However, this book is about something bigger than microfinance. It’s about social business– a type of capitalism and entrepreneurship that is selfless. It’s not about becoming an entrepreneur not to make profits to keep, but to make profits to sustain the business, which is formed around a goal to help others and eradicate poverty. He writes that this new form of economics/capitalism could be taught in schools. This is literally what I am doing with this study, but I have never called it “social business” before. Now, I am rethinking everything I have been plugging away at these last couple of weeks. I am only 25 pages into this book; I seriously started reading it an hour ago. 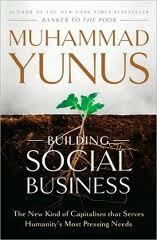 I promptly started following Yunus on Twitter, which is what I do when I discover something new, and I found out that today (June 28) is “Social Business Day”. It’s like a sign that I found something bigger. In the Steve Jobs biography I read last week, he said that there are times when he gets pretty far in developing a new product and then discovers a way to take it in an entirely new, and better, direction. Part of his genius was that he was not afraid to change course when the need arose. Including more about social business would not be “changing course” for me, but instead looking at things from a new angle. I am now getting excited about this study’s potential to empower students to change the world through education. Which is, duh, why I became a teacher in the first place.